KATHMANDU, April 13: Nepali film ‘Ghampani’, which is set to be released on Friday, has premiered at Big Movies in the Capital today. Directed by Dipendra Lama, filmmakers, cine journalists and those associated with film industries were present in the premier show of the film. 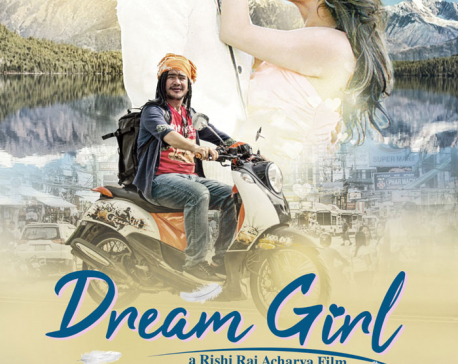 Senior Journalist Kishor Nepal, who was seen in the premier show, described ‘Ghampani’ as a beautiful film made out of simple story about inter-caste love. “We have got an opportunity to watch a beautiful film after a long time. I am hopeful that it would win hearts of many people as it is based on inter-caste love story,” he commented after watching the film. Similarly, litterateur Usha Sherchan also commented this film as interesting as it revolves round the inter-caste love story. “ I am impressed by the talent of the director who has skillfully presented inter-caster love story in a simple yet romantic way,” she said. Director Lama has given an eye for minute details into the film with brilliant presentation. Since ‘Ghampani’ is my debut film, there might be many weaknesses in it. I will avoid them in the coming films,” said Lama. Produced by Cinema Arts, Highlights Nepal and Torchlight Pvt. Ltd., the film will be shown in over 60 movie halls across the country on Friday. The mainstream film features Kaliwood actors Dayahang Rai, Keki Adhikari, Ankit Khakda, Silsa Jirel, Pushkar Gurung as the major characters. Similarly, Buddhi Tamang, Bijaya Rai, Kabita Ale, Aruna Karki, Maniram Pokharel, Prembarsha Khadka, Samranta Thapa among others have also performed their roles in the film. Likewise, Kaliprasad Baskota, Chandra Kumar Dong are the composers while Shailendradhwaj Karki is the cinematographer in the film.